Everybody loves a good con, as long as they aren't the victim of it. This is the true tale of the most notorious con men to come out of Brazil...or I could be trying to pull a fast one on you. Movie about con men/women are a dime a dozen, but when they�re done right, they�re an invigorating, engrossing experience. The best of these, The Grifters, Nine Queens, and House of Games, to name a few, do a magnificent job of weaving intricate webs of deceit, trickery, and game-changing revelations that keep us guessing until the final major twist is revealed. 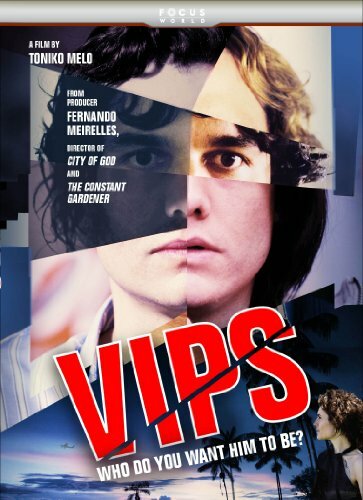 VIPs is a 2010 Brazilian film that, while not as intensely twisty or even as intricately plotted as the aforementioned best of the con-film bunch, contains enough of the spirit of the genre to make it nearly just as entertaining. Director Toniko Melo�s film actually more closely resembles Catch Me If You Can, then a straight up con-centric film, but his vision is much more complex and entertaining than Steven Spielberg�s lighter, more popcorn-friendly take on the genre. Entertainment One�s DVD brings the film the wider U.S. audience it deserves, it�s just too bad there isn�t an accompanying Blu-ray release to give it some added pop. Marcelo (Wagner Moura) is a strange, misunderstood teenager growing up in Brazil and living with his mom. His pilot father is never around, given his career, and other mysterious reasons, but Marcelo wants to model his life around him. One day, Marcelo seizes an opportunity and poses as a pilot to transport a drug smuggler. When he impresses the drug runner, he�s hired on the spot, and is soon in way too deep in a world he could never have imagined. As another opportunity presents itself, Marcelo jumps on it as well, and finds himself impersonating one of the owners of Gol Brazilian Airlines. This very well could be the con that finally does Marcelo in, but given what he�s already been through and what he�s accomplished, it�s tough to bet against him. A rather important auxiliary character in Marcelo�s life plays a rather large part early in the film, then shows up sporadically throughout, whether it�s via a phone call or in person. Unfortunately, Melo tips his hand as to a rather huge twist involving this character within the first 15 minutes. While, in hindsight, the twist is rather predictable, regardless of this major clue, it�s a shame that Melo goes such an obvious route. The scene in question involves an airport janitor stopping to look at Marcelo and the aforementioned auxiliary character at a time where he never would have looked had something not been right with the reality of the situation vs. what Melo shows us on-screen. This is one of those shots that we mostly go back to in order to find where clues might be for such a twist, but in this case the shot lingers mere seconds to long, to where there�s no need to go back at all as the twist is spoiled the first time through the film. Wagner Moura�s performance has every right to be a horrible one. For the first few minutes of the film, he crafts Marcelo as an extremely annoying boy, causing me to worry that he might not be able to recover from such a bad first impression. Fortunately, that isn�t the case, and once Marcelo heads off to his first con job and takes on the persona of Carrera, we realize that Moura is doing something special. It�s must be extremely difficult for an actor to take on a role that is based on a real person (in this case, real con man Marcelo Nascimento da Rocha), but Moura does his job effortlessly in VIPs. This is one of those films that truly snuck up on me and turned out to be much more impressive than I expected. There�s a good chance that VIPs will continue to fly under the radar and continue to be ignored by the majority of DVD renters/buyers, and it would be a real crime if that does, indeed happen. Entertainment One has done a decent job ensuring that the film ceases to be obscure, as their DVD features great audio and video presentations. Again, both of these technical aspects would benefit from a Blu-ray disc, but the 1.85:1 anamorphic widescreen presentation that�s here is an excellent one. The color rendering is the best visual aspect, with bright, vivid hues practically popping off the screen, regardless of the location that a given scene is being shot at. Images are nicely detailed; with very little grain, dirt, or other print defects. The Dolby Digital 5.1 audio is also fantastic, exhibiting nice directional effects during the flying sequences, and always integrating the crystal clear dialogue into the overall audio mix flawlessly. The extras leave a little to be desired, but the included interviews are interesting and add some nice background to what is already a compelling story.